Alex Cowl-collar knit pullover with inset A-line front, gathers at center back neckline. Curved sides extended to mid-thigh. Long sleeves. Olive Scoop-neck knit pullover with diagonal side seams and exposed decorative back zipper on the diagonal. Curved left back hem detail and open vents in long sleeves. Zipper is a 22" separating zipper. Suggested Fabrics Two-way stretch knits only. Notions 22" Zipper (Olive), Thread. 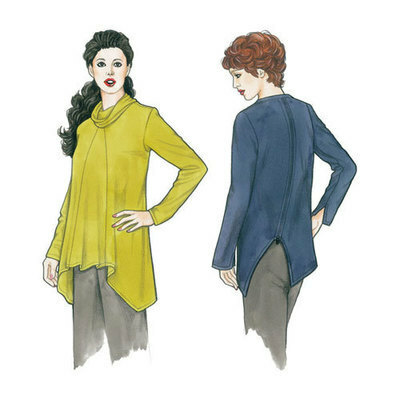 Check out a FREE tutorial on making the Alex top without a cowl on our blog! Let Linda show you everything you need to know about sewing with knits! Try Linda Lee's Sewing Fashion Knits course on Craftsy.